Design Originals-Zentangle 2. Zentangle 2 is primarily geared towards people who are into scrapbooks, sketchbooks, journals, and ATCs.And, for teachers, this is a great sequel to Zentangle Basics.There are lots of tips on how to embellish scrapbooks and journals with Zentangle® patterns, and there are 40 patterns included with step-by-step illustrations of how to draw them. 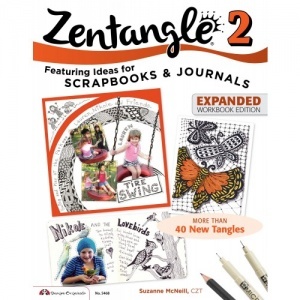 A few of the patterns are carried over from Zentangle Basics, but there are enough new ones and creative tips and ideas that Zentangle 2 is a worthy addition to your Zentangle® library.